The best way to learn about any software is to see it for yourself. 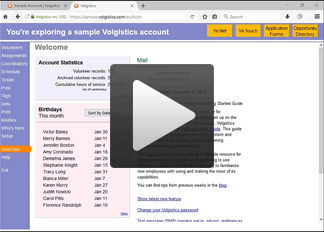 We're happy to provide you with a guided tour of the main features in Volgistics, as well as answer any other questions you have about the system. Sign up below! These sessions allow us to connect with you and your team directly to provide you with an overview of Volgistics. This are ideal for new and prospective users of the system, as well as organizations or individuals who are evaluating Volgistics against other systems and have specific questions. A member of the support team will give you a guided tour of the system, looking at the features that are important to you and answering your questions along the way. We host open group demonstrations about once a month, on set days and times. These sessions are ideal for new users of Volgistics looking for an overview of how the system works. We'll cover a set of basic features, including how to add new volunteers, build a schedule, and record service. We'll also have time to take questions from the audience. Click the button below to choose a session that works for you and your team! If you're not able to attend one of our live sessions, that's OK! We've got the most recent recording available below. If you have any questions that aren't answered in the demonstration, we'd love to hear from you. Just visit the Support page to send an inquiry to the team. We'll get back to you quickly.